Thatchers Cider is demonstrating its firm commitment to the craft of making apple cider with the launch of two new ciders. Thatchers Red and Thatchers Somerset Haze are the latest apple ciders to be created by the Somerset cider maker at Myrtle Farm, just outside Bristol, using the expertise passed down over four generations to create contemporary style ciders using classic cider fruit. Both Thatchers Red and Thatchers Somerset Haze have been crafted to appeal to a new generation of cider lovers, each with a modern twist on a classic style of cider. Thatchers Red is, as its name suggests, a red apple cider. Mellow, refreshing and fruity, it has a subtle, sweet dessert apple flavour, to appeal to consumers who have been introduced to cider through sweeter fruit and flavoured drinks but who now want to experience the depth of apple cider. Thatchers’ cider makers have selected their favourite Katy apple to provide the intense red colour and soft fruitiness, while the Jonagold Red apple lends a mellow, sweet flavour. Thatchers Red has an abv of 4% and will be sold in a range of formats – 500ml and 330ml glass bottles and keg. Cans are also planned for the future. It has an RRP of £2.09 for a 500ml bottle. Fourth generation cider maker Martin Thatcher says, “Once again our cider makers have come up with an entirely new take on a classic cider. Refreshing and sweet, Thatchers Red will appeal to those consumers who favour fruit and flavoured ciders, and who now want to begin their exploration of apple cider. 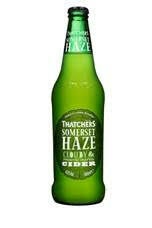 Thatchers’ second introduction is Thatchers Somerset Haze. A premium crafted cloudy cider, Thatchers is again taking a traditional style English cider and giving it a contemporary twist to widen its appeal. Appealing to the new cider drinker, as well as existing lovers of apple cider, Somerset Haze is crafted for laid-back, relaxed and sociable drinking occasions. Thatchers Somerset Haze (4.5%) is crafted with Discovery, Falstaff, Gala and Jonagold apples to create its crisp sweet finish. It is the juice of the Jonagold apple that brings a naturally hazy appearance to this cider. It will be available in a range of serve formats including 500ml bottles, 440ml can, and draught, and its RRP is £1.99 for a 500ml bottle. Both the new ciders have been created at Thatchers Myrtle Farm by the family-run company’s master cider makers. With over 360 acres of its own Somerset orchard, it will be undertaking a programme of a further 75 acres of planting this year. It also has a network of growers throughout the UK with whom it has established long term 25 year contracts. Not feeling very imaginative with your product names eh Thatchers? Thatchers Red = Devon Red and Somerset Haze = Devon Mist. Right?